NEW IMPLEMENTATION OF A LEGEND. Since year 1968 this style of compression dominated hundreds of recordings and to this day it is most commonly used signal processor in the industry. Lightning-fast attack and release times became main companions of audio engineers. 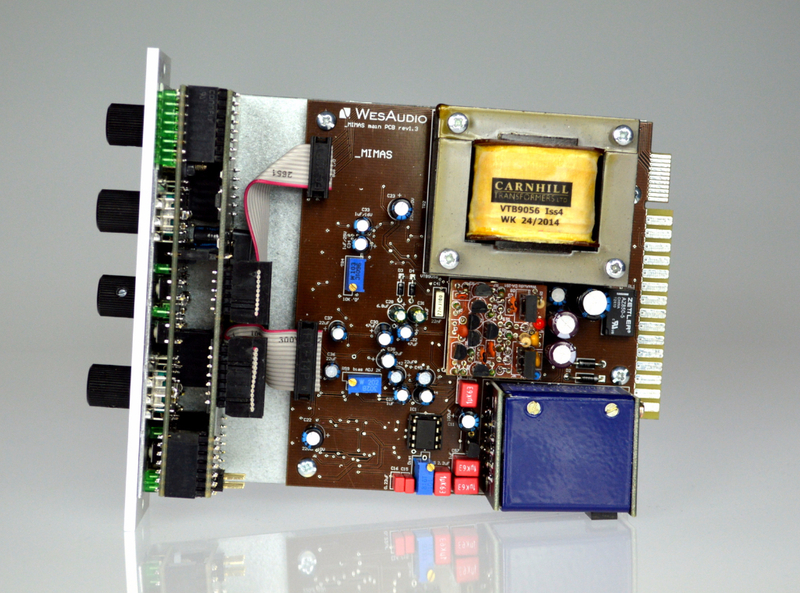 WesAudio proudly presents _MIMAS – ng500 series implementation of legendary FET compressor. This time along with classic analog sound You will receive most demanded feature in audio industry – DIGITAL RECALL. 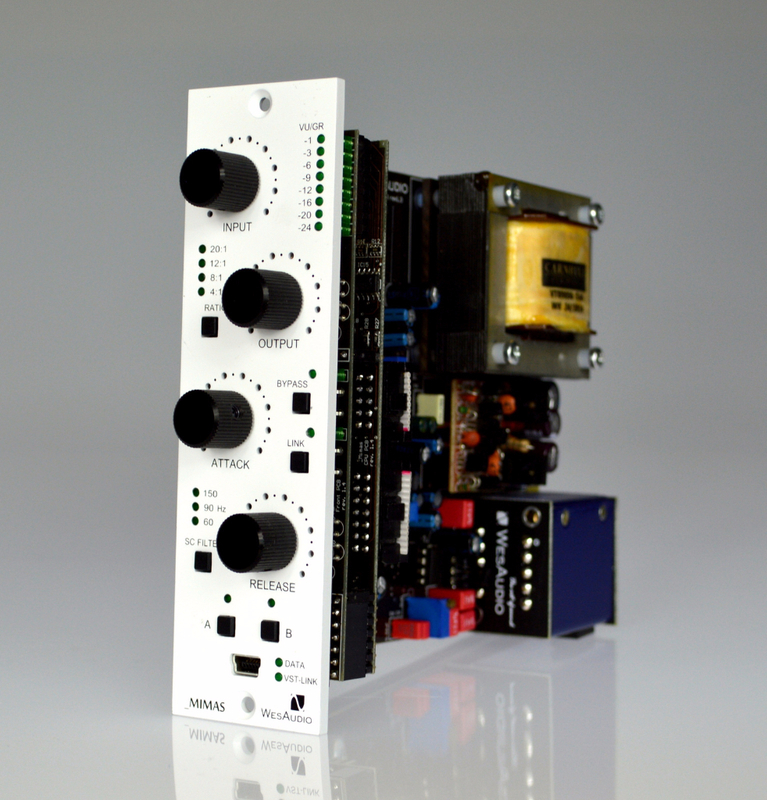 _MIMAS – CARNHILL TRANSFORMERS are foundation of its sound. First and most important point – _MIMAS is fully balanced (IN/OUT) analog device with +24dBu of headroom. FOUR RATIO SETTINGS AND LEGENDARY “ALL BUTTONS IN”. _MIMAS provides selectable classic ratios of 4:1 and 8:1 for compression, and 12:1 and 20:1 for limiting. If more aggresive type of compression is needed, “All Buttons In” mode is right there to use it. Once again we would like to state loud and clear – it is analog compressor, so is “All Buttons In” MODE! Classic implementations of 1176 provide functionality to disable compression and still add color and character to signals. _MIMAS is no different, however instead of using INPUT and OUTPUT knobs to create desirable effect, You can do it with ONE knob, which configures amount of saturation affecting a signal. Regardless its extensions, _MIMAS is fully compatible unit with 500 series standard (*). Digital features can be enabled through front panel mini USB socket. ng500 – Next Generation 500 series is a physical extension to 500 series, which makes _MIMAS fully compatible with _TITAN frame – this allows to control all devices in chassis through one USB/Ethernet cable. Even using _MIMAS as pure analog signal processor you can easily switch between two parallel settings with a magic of a simple buttons. 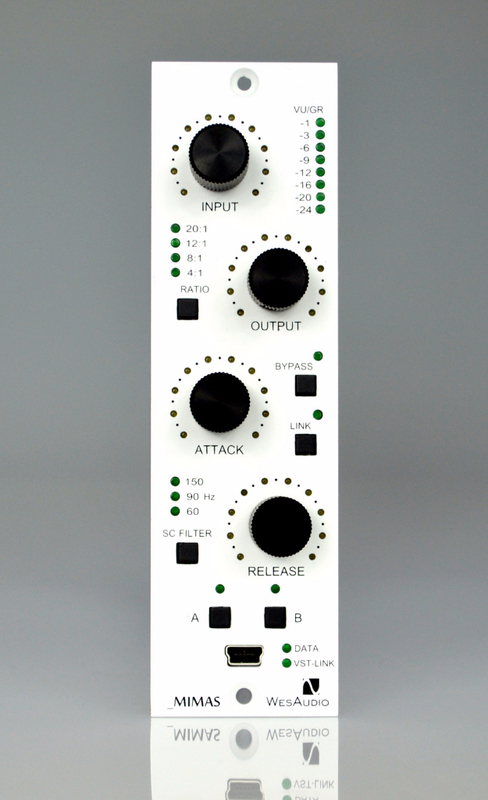 Along with classic analog compressor You receive most demanded feature in audio industry – TOTAL RECALL. Full plugin control through VST2/VST3/AU/AAX/AAX DSP – makes _MIMAS compatible with most, if not all major DAWs. Total integration with your beloved DAW will change your workflow forever! I’m sure all of us wanted to use different device settings based on song section. Now it is possible! Just draw automation lines in your DAW and your analog device will follow! And remember, you can use four touch sensitive encoders to record automation TO your DAW! – Free software and firmware upgrades. To download high resolution files please use this link.